Villa d’Este is located on a stretch of land below Tivoli. Situated on the Aniene river, Tivoli, Italy is a picturesque town north-east of Rome and a popular spot for tourists. Tivoli’s two most popular attractions are the Villa d’Este and Villa Adriana, also known as Hadrian’s Villa. They are both listed on the UNESCO World Heritage List, and both are incredibly breathtaking. Built in the 1550s for Cardinal Ippolito d’Este, the Villa d’Este is located on a stretch of land below Tivoli. The Villa offers visitors a gorgeous view of the Italian countryside, facing Rome. 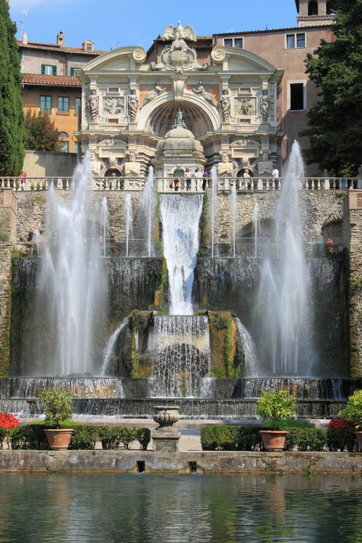 However, it is the garden at the Villa d’Este and its famous fountains that will truly take your breath away. The garden, specifically, is designated a UNESCO World Heritage Site. The Villa d’Este can be enjoyed as a half-day trip, although you may find yourself wanting to spend a bit more time in the tranquil gardens. Spreading over acres of countryside and combining several different architectural styles – mostly Greek and Egyptian – the Villa Adriana, also known as Hadrian’s Villa, was built during the second and third decades of the 2nd century AD as a retreat for the Roman Emperor Hadrian and, eventually, his successors. This awe-inspiring archaeological site takes luxury to a new level, featuring over 30 buildings, including palaces, a theatre, libraries, a stadium, temples, numerous water features, and so much more. Visitors can spend hours simply wandering the extensive ruins of the Villa Adriana. Visit soon as the site was placed on the World Monuments Watch list of endangered sites in 2006. AESU offers several trips to the Italy, including Cosmopolitan, Explorer, Euro Focus, Great Escape, Euro Spree, and, of course, Viva Italia. Join one of our tours and see the beauty of Tivoli, Villa d’Este, and Villa Adriana yourself. This entry was posted on Thursday, July 16th, 2015	at 5:49 pm	. You can follow any responses to this entry through the RSS 2.0	feed. Both comments and pings are currently closed.